Goa’s Church as well as Aam Aadmi Party have come down heavily on the Bharatiya Janata Party government for spreading terror in the mining areas and once again allowing miners to loot Goa’s mines, illegally. 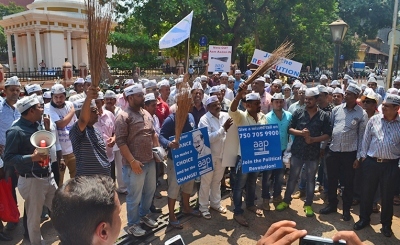 AAP members in fact staged a demonstration in front of Goa’s police headquarters yesterday demanding arrest of Sanguem MLA Subhash Phaldesai, holding him responsible for jail-assault on mining activist Ravindra Velip. Villagers of Caurem in Quepem taluka are once again up in arms against alleged illegal mining under the garb of transporting e-auctioned ore.
As they tried to stop ore transport, police arrested them on three different occasions since 21st March while Ravindra, the local panch, was blind-folded and assaulted at Sada sub-jail by unknown goondas on 23rd March. The Council for Social Justice and Peace has reminded the government that such terror against illegal mining in 2011 in Caurem had ultimately resulted into ban on total mining in the state for over two years. “It appears that no lessons have been learnt by the Government and the mining companies after the mining ban and its consequent economic and social fall-outs”, states Fr Savio Fernandes, executive secretary of CSJP. He also states that the lifting of mining ban by the Supreme Court should in no way be assumed to be a license for the Government and mining companies to indulge in violation of human rights and illegal mining. Rather than following repressive tactics, CSJP has urged the government to adopt the path of dialogue with all the stakeholders by respecting the life and dignity of every citizen living in the mining belt. The use of state repression to cover up gross illegalities and irregularities in the mining activity could only spell doom to the future of mining industry in Goa, cautions Fr Fernandes. While staging a demonstration opposite police headquarters yesterday, AAP has alleged that the BJP government is allowing mining companies to get away with daylight robbery of iron ore by violently suppressing the tribal villagers of Caurem. The AAP leaders also presented a memorandum to IGP Sunil Garg, urging him to file FIR based on a complaint filed by Ravindra about his assault and arrest Sanguem MLA Phaldesai. The political party has also demanded immediate suspension of Sabaji Shetye, jail superintendent and Bhanudas Pednekar, the deputy superintendent, pending inquiry. The delegation was led by Dr Oscar Rebello, Rajeshree Nagarsekar and Rupesh Shinkre. If Congress & BJP start giving Mining Royalty to Goans then Goans will be rich and no need to go out of Goa in search of Jobs. Goans will remain in Goa and will do Business. Goans will be the richest people in India. Goans are blessed with the MINES but due to the greediness of Congress & BJP, Goans are suffering!